In 2015, Apple was hailed as the world’s #1 in Forbes’ World’s Most Valuable Brands list, followed by runners-up Microsoft, Google, and Coca-Cola. It makes you wonder: what makes a brand so well-loved? “The essence of a brand is not the exterior elements, but how you feel about the product or service,” says Inc.com’s Geoffrey James in his article, “How to Build a Really Strong Brand”. What is your mission? Where do you want to go? What is your company’s purpose? You need to know the driving force behind your company—your soul—if you want to build a memorable brand. “Those guided by a purpose beyond making money — returned six times more to shareholders than explicitly profit-driven rivals,” says a Financial Times article as a highlight of the book, “Built to Last”. 2. What sets you apart from the rest? What benefits does your product give to your customers? You need to define what makes you different as a company. Your purpose can also help define your product, as it serves as your compass to your brand’s true north. Learn to differentiate yourself from the rest. 3. What do you want your customers to think of you? Is it more important that people know you as efficient, or would you rather let them know you’re friendly? Would you want people to know you’re cutting-edge, or do you want to evoke feelings of familiarity and nostalgia? What emotions do you evoke from your customers? How do you want them to know you as? You can’t be everything for everyone, so you have to decide what exactly you want to be. As the world’s largest freelancing marketplace, Freelancer.com helps startups and freelance professionals succeed by providing the best platform to get different kinds of jobs done, whatever they may be. And together with premier workshop organizer Manila Workshops, they’ve organized a special talk which will help you create a powerful, memorable brand. Listen to leading graphic designer & illustrator, the Art Directors Club Young Guns Award-winning Dan Matutina, as he deconstructs branding concepts during the Talino Talks: Branding 101 for Beginners event, happening on February 20, 2016, Saturday, 1 PM at the Freelancer.com office, 30th floor, Ecotower building 32nd cor 9th Avenue, Bonifacio Global City, Taguig. This event is supported by media partners WheninManila.com and TheFortCity.com. 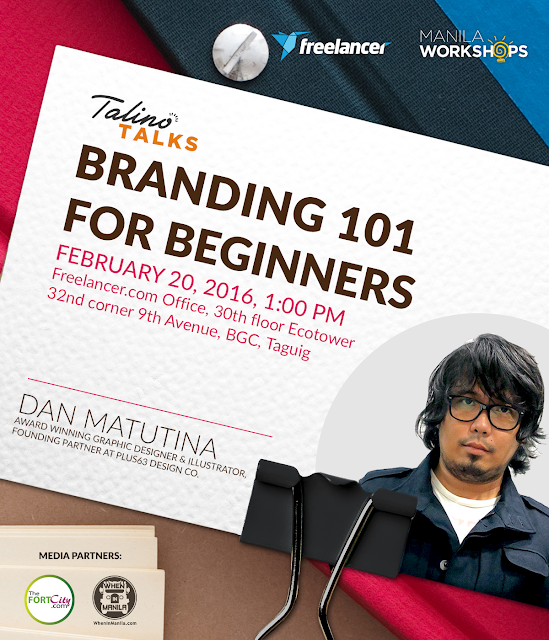 Seems that those entrepreneurs with startups should attend this talk to learn about branding.